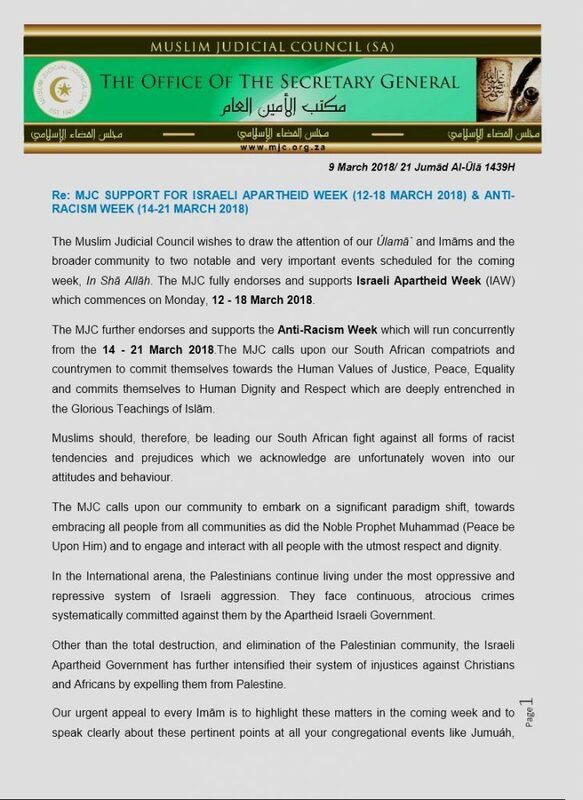 The United Ulama Council of South Africa (UUCSA) — of which the MJC is one of the founding members — requests Imams to read the attached message this Friday 16th March 2018 during the Juma salaah which coincides with Israeli Apartheid week and Anti-racism week. Israeli Apartheid Week takes places across the world during different weeks in February and March. 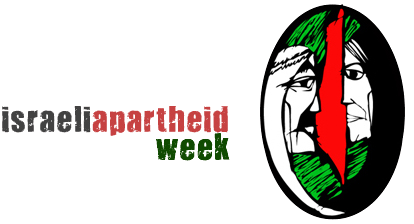 The 14th International Israeli Apartheid Week takes place in South Africa between the 12th and 18th of March 2018. Israeli Apartheid Week is an international series of events that seek to raise awareness of Israel’s apartheid system over the Palestinian people and to build support for the growing Boycott, Divestment and Sanctions (BDS) movement. These were the words of Prophet Moosa (as) to his people as he urged them to enter Jerusalem and rid it of tyrannical and corrupt political control. The blessed land of Jerusalem faces the same challenges today as it faced during the time of Moosa (as). It requires the same intervention that Moosa (as) called his people to, the same lonely cry echoes from the minarets of Aqsa every day! There is no city in the world today more hotly contested than Jerusalem. For thousands of years, this blessed city has stood at the crossroads of the trade route and religious traditions. Ever since it illegally occupied Jerusalem in the 1967 war, Israel has gone to great lengths to destroy the Islamic character of the city, changing street names and other signage from Arabic to Hebrew and English, demolishing mosques, building settlements, denying equal access to education, healthcare, employment, residency and building rights. Palestinians are forced to pass through checkpoints, carry permits and face the indignity of a wall that turns the West Bank into an open prison. Israel is expelling thousands of Africans, giving them an ultimatum: leave by 1 April or risk indefinite imprisonment. Its ultimate aim is to drive out the indigenous Palestinian population from Jerusalem and to purge it from those that it regards as sub-humans. As Muslims we need to play our part, we need to encourage people to turn to Allah, to champion the cause of the oppressed Palestinians as best as we can, we need to rally to the call of Moosa (AS) to rid the blessed land of tyranny through all legal means available to us. Victory is promised to the believers who act with faith and consistency. The Quran says: “Allah has promised those among you who believe, and do righteous good deeds, that He will certainly grant them succession to (the present rulers) in the earth, as He granted it to those before them, and that He will grant them the authority to practise their religion, that which He has chosen for them (i.e. Islam). And He will surely give them in exchange a safe security after their fear (provided) they (believers) worship Me and do not associate anything (in worship) with Me…”(24:55). We beseech Allah to send the rains of His mercy to the parched lands of the oppressed, Ameen.